In addition to home care such as brushing and flossing, regular preventative dental appointments are extremely important to keep your mouth healthy. We have found that our patients that regularly keep up with their preventative appointments tend to have less major dental problems, and those problems that do develop are caught at an early stage. 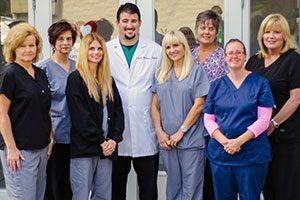 Dr Bernard and our skilled hygienists see patients of all ages, and will develop a preventative program tailored to your specific dental needs. The cornerstone of the preventative visit is the prophylaxis(dental cleaning). During this procedure, the hygienist gently removes tartar, plaque, and stain from the teeth. Removing these irritants reduces inflammation of the gums, which helps to prevent gum disease(gingivits) and promotes your overall health. Usually, a thorough exam is also completed at the preventative visit. Dr Bernard and the hygienists will check the gums, teeth, and soft tissues of the mouth for any abnormality. Our computerized X-rays may also be taken at this visit to allow us to get a different view of the teeth and/or jaw bone. Other preventative services include fluoride application and sealants. During fluoride application, a fluoride containing paste is applied to the teeth to harden them and make them more resistant to cavities. Sealants are resin coatings that applied to the chewing surfaces of the teeth to protect them from tooth decay.